Here I am again, back with another bookish subscription box review for you. This time I will be focusing on my first box from Book of the Month Club. Book of the Month Club is a subscription service that has been around since 1926! Each month on the 1st, BOTM’s 4 judges and 1 surprise guest judge each nominate their book choice for the month. Then, you have until the 6th of the month to choose which book you wish to be the one sent to you, or you can also skip that month if none of the options appeal to you! How great is it that you get to decide which book is sent to you?! You also have the option to choose books from past months choices, as well as a special list of some of the judges favorite books from any genre. The monthly selections are typically literary fiction, so just be aware of that if that is a genre that doesn’t particularly interest you. Subscriptions start at $14.99 per month, and you can also add up to 2 extra books to your box for $9.99 each. All books are hardback and have the BOTM logo on them as well. 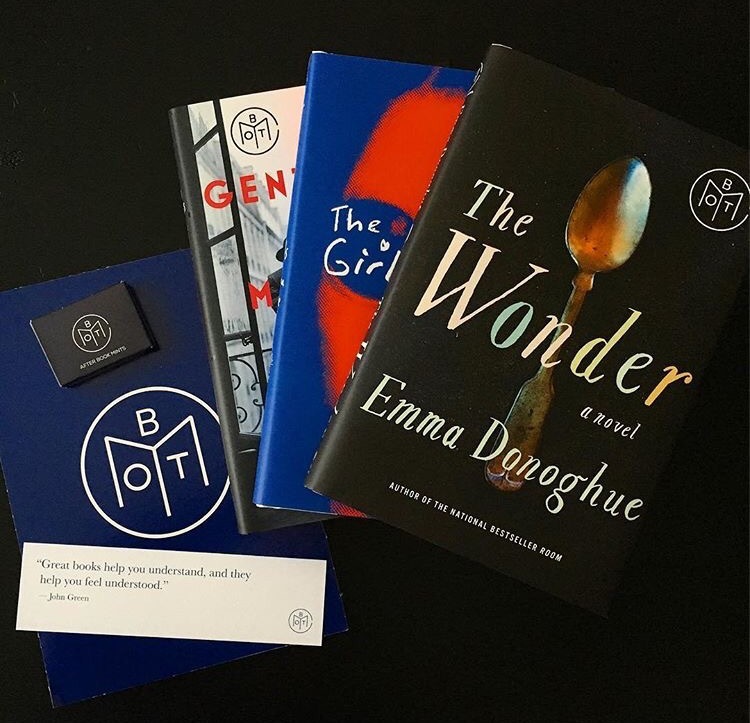 Each box comes with a letter from the judge explaining why they chose that book, a BOTM bookmark, and a little bitty gift as well. If you are interested in subscribing to the BOTM Club, just click on the link HERE. Are you a Book of the Month Club member? If so, have you enjoyed the choices for the months that you’ve been subscribed for? Which nominees have been your favorite? Have you read any of the books that I received? What book subscription boxes do you subscribe to? Yes, and I love that they’re always so different! And there’s such a big collection from previous boxes as well. I know that the shipping is free in the US but I’m not sure about to Canada. I wouldn’t expect it to be too much though. You should definitely check out their website to see! I really want to read The Girls! I can’t wait to see what you think of that one. Hmm… I would consider giving this one a shot. I don’t read tons of literary fiction though. So do you have to subscribe to whatever book they’re giving out that month first before you can add on the additional books? I’m definitely not doing Fairy Loot again after the fortune it cost me with the pound conversion. And this one has been around for ages. Pretty cool! There is at least one thriller as a choice each month too if literary fiction isn’t really your thing! And I don’t really know about skipping the month and just doing add ons. You might want to check their website and see if it’s mentioned there. So far, I’ve found at least one book that piqued my interest, as the 5 choices are always so diverse. And this month’s options were really good, I had a hard time choosing which one! Plus, you can always skip a month if you don’t find anything which is nice. Oh that’s good to know. I was thinking about checking out this box. I like that you can add other books and the price point is much lower than OwlCrate. Yeah, I also like that you get so many of options and you don’t have to worry about getting a duplicate book from another box too. But there isn’t any of the extras that you get from other boxes.